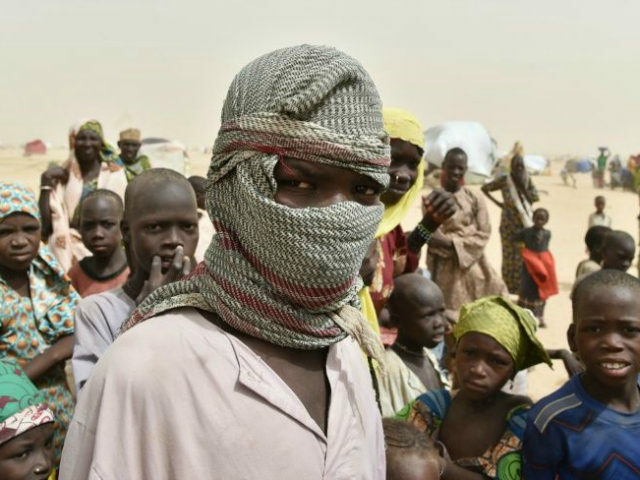 Boko Haram jihadis reportedly cut men “into pieces” with machetes and set houses ablaze in weekend attacks that displaced an estimated 1,300 people in Nigeria’s Borno state, the terrorist group’s birthplace and stronghold. On the same day of the assault, Saturday, the Nigerian military announced that it had “reintegrated” at least 254 Boko Haram jihadis who surrendered and repented, the state-run News Agency of Nigeria (NAN) reported. Saturday’s heinous attacks came days after Nigerian President Muhammadu Buhari repeated his assertion on Thursday that his administration will soon defeat Boko Haram. “We are confronting them, and by the grace of God we will destroy them,” he declared. Since taking office in 2015, the Buhari administration has on several occasions claimed victory over the Islamic State (ISIS/ISIL)-linked Boko Haram only to have the terrorist group carry out deadly attacks soon after the allegation. Thursday’s claim was no exception. By Saturday, Boko Haram jihadis had invaded the village of Kuwa-Yangewa in Borno. Rachel Hassan, identified as an eyewitness, told the state-run News Agency of Nigeria (NAN) “that when the insurgents attacked the community, they asked women to go while the men were macheted,” the Sahara Reporters outlet revealed. “I hired somebody, a displaced person residing at the Bakassi Internally Displaced Persons (IDPs), to work on my farm. The insurgents came and gathered us in one place. They asked women to go and macheted the males,” she said. She reportedly indicated that “some of the corpses were cut to pieces” and that she reported the case to local police. While the Nigerian army claims Boko Haram only killed two people during the attack, sources told Sahara Reporters the jihadis executed at least ten people. Malam Ahmadu Salisu, a relative of one of the victims, and Nigerian Brig. Gen. Abdulamalik Biu confirmed that the jihadis “butchered” some of the victims. “Some people went to the farms and Boko Haram insurgents attacked them. They butchered an elderly man and a youth,” the top Nigerian general declared. “So far, we recovered four corpses from the farms, while eight others are missing or abducted by the insurgents,” Salisu added. In separate attacks on Saturday in Borno state, Boko Haram terrorists, who reportedly rode into the area on gun trucks and motorcycles, also set some houses after carting away food items from shops and killed one person. The agency revealed that the terrorists targeted three communities in Borno — Dala Malari, Fuguri, and Femani.